MANCHESTER, N.H. — The meeting of two presidential candidates here today was billed as a successor to the Lincoln Douglas debates, but turned out to be a festival of self-congratulation intended less to tease out differences between Newt Gingrich and Jon Huntsman than simply signal their status as serious men. “This is not a Hollywood game, this is not a reality show: this is reality,” Gingrich said, drawing a crack from Huntsman about his plans to participate in a debate moderated by television personality Donald Trump. “We’re always looking for winners and losers in these things, but I think the winners might well be the American people,” Huntsman said after the debate. The 90-minute talk at St. Anselm College, moderated by local Republican operative Patrick Griffin, centered on national security and foreign policy, and the two men ranged widely across Asia and the Middle East. The debate showed a few of their differences – Huntsman, notably, favors a rapid withdrawal of troops from Afghanistan – but it lacked the animating point of the 1858 debates on which it was modeled: a core disagreement. Indeed, Gingrich and Huntsman agreed so often that two members of the press, and Huntsman’s young daughters, dozed at points during the 90-minute debate. Most disagreements were hard to detect, and quickly papered over. Of course if the media wants some stark disagreement, they don't even need to throw Jon Huntsman in the ring with Gingrich. They could just play clips of Newt waxing socialist over the last thirty years and make him argue with himself. I dare Newt Gingrich to have a debate like this with Ron Paul one on one. I'd love to see it. 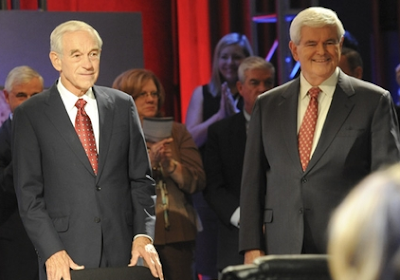 All the alleged intellectual prowess Newt Gingrich would crumble before the superior weight of Ron Paul's principle, consistency, facts, and authentic brilliance.